Are you worried about making a content marketing mistake that tanks your content strategy? You should be, because content marketing is a crucial part of attracting and retaining your customers, so getting it wrong can be costly. One of the best ways to avoid harming your reputation and revenue is to learn from the best. 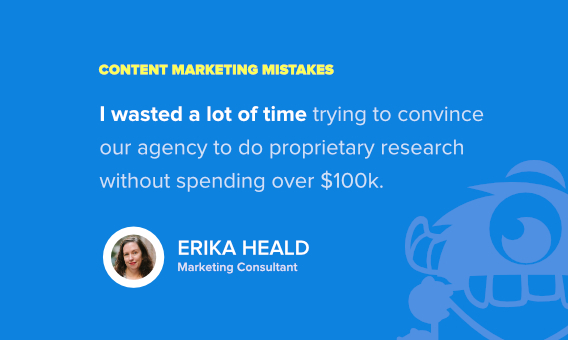 That’s why we reached out to 14 content marketing experts and asked about the worst content marketing mistake they’ve made or seen. As you’ll see, even the experts can make catastrophic content fails. By the end of this roundup, you’ll know the worst content marketing strategies to avoid. These content marketing tips will help you create a content strategy that works. Let’s kick off with a cautionary tale from Andy Crestodina about a situation where he made a content marketing mistake that hurt his reputation. As Kuno Creative points out, public speaking is content marketing, too, and although it relates to a presentation, the lessons at the end relate to any type of content marketing. Andy Crestodina: I’m on my way to Las Vegas to speak at a conference. I spoke there last year and I was honored to be the top rated speaker. So this should be no problem, right? The organizers want me to cover analytics again. But since I did that last year, I want to give attendees something new. So a few weeks before the event, I suggest a change in the topic: Google Tag Manager. The programs have already been printed, but they can still change it on the website. So we should be good, right? I’m not really an expert at Google Tag Manager, but I recently wrote a popular post on the topic and I got a pro to review my slides in advance. Everything looks good. So this should go fine, right? I hit the stage in a room of about 60 people. My opening statement is a reminder that the printed programs aren’t correct. I’m covering a different topic, so if there’s another session you want to see, don’t feel bad walking out. The energy in the room drops and a few people leave. Others just look annoyed. This isn’t a great start. As my presentation gets going, I know I’m bombing. This isn’t going well. I feel like I betrayed them. I also can tell that a few people are a little bored. They know this stuff. Others are confused. This stuff is kind of technical. So I speed up a bit to get through to some of the more valuable points. I also just wanted this to end and stop wasting people’s time. Luckily, I have a few friends in the audience. They look sympathetic. Finally, it’s time for Q&A. No, I can’t really answer the best questions because I’m outside my area of expertise. Crash. Burn. The disaster is complete. The printed description didn’t match the session. That’s a sin at conferences. I gave a new presentation to a big room. Never a good idea. Always test new presentations at smaller events. My topic was on the outside edge of my knowledge. Even though the presentation was accurate, I wasn’t able to add value during the Q&A. 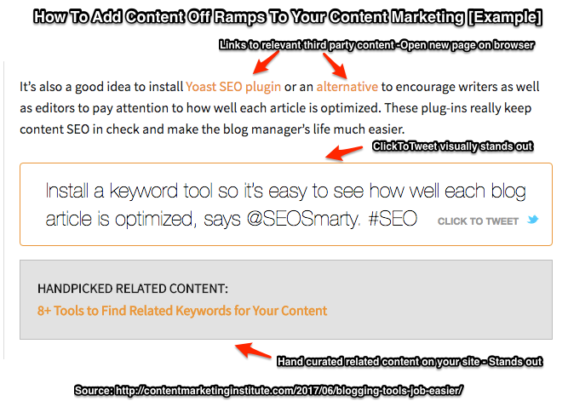 How can I fix this content marketing mistake? I really can’t since it was an event. But I’m sharing the story. It’s a cautionary tale. Please don’t do what I did. You’ve been warned! Andy Crestodina is a co-founder and the Strategic Director of Orbit Media, an award-winning 38-person web design company in Chicago. He is also the author of Content Chemistry: The Illustrated Handbook for Content Marketing. Find him on LinkedIn and on Twitter as @crestodina. 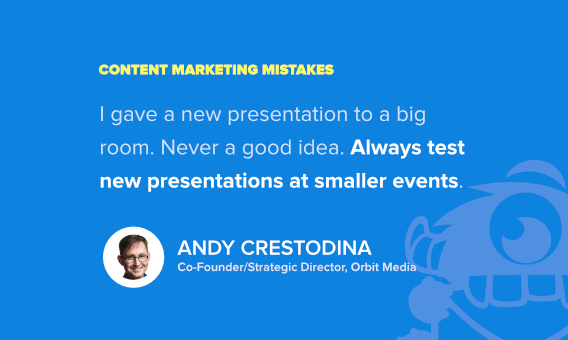 Now, some of our experts reveal the content marketing mistake they most regret. 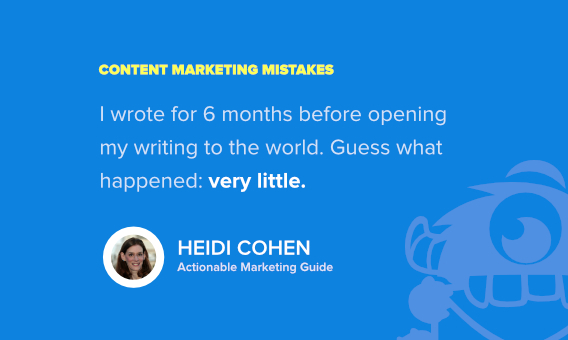 Heidi Cohen: My worst content marketing mistake? Despite writing a bi-weekly Actionable Analysis column for ClickZ since 2004, I put off starting my own blog. Once I decided to start blogging, I wrote for 6 months before opening my writing to the world. Guess what happened: Very little. Heidi Cohen is the Chief Content Officer of the award winning Actionable Marketing Guide, focused on social media, content and mobile marketing. Find her on Twitter as @HeidiCohen. 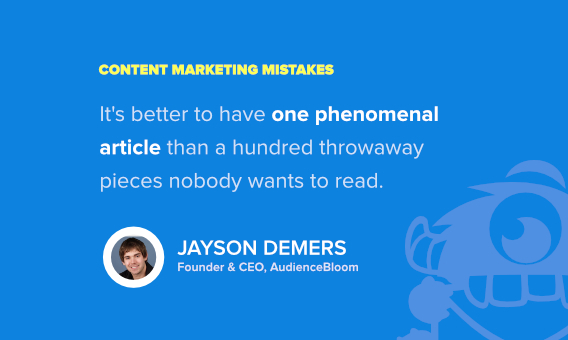 Jeff Bullas: My biggest content marketing mistake wasn’t a one-off but a strategic error. The mistake? Not taking advantage of the traffic the content was generating in building my email list. It cost me over 100,000 subscribers. That is a big mistake. I fixed it by creating pop-ups that captured emails and built my email list. Today I have over 160,000 on my email list. Jeff Bullas is an entrepreneur, blogger, author, marketer and international keynote speaker and works with businesses to optimize their digital brand with content, social media and digital marketing. Follow him on Twitter as @jeffbullas. 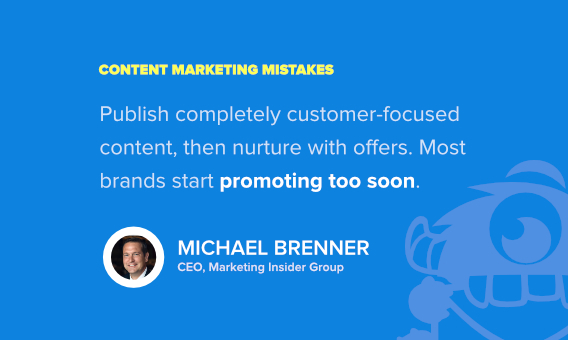 Michael Brenner: The worst content marketing mistake I made was early on in my launch of a content hub for SAP. We realized we needed to fill a gap in top of funnel content. We planned and executed against that gap, thinking readers would start converting to product pages. Oh boy, were we wrong. NO ONE converted for months until we realized we needed a mid-stage offer strategy as well. Michael Brenner is a globally-recognized keynote speaker, author of The Content Formula, and CEO of Marketing Insider Group. Michael teaches leaders to champion their people and the ideas that make the greatest impact. Find him on Twitter: @BrennerMichael. Ann Smarty: My biggest content marketing mistake was not optimizing for leads for years. I started a blog in 2010 and I hadn’t been doing anything to build up a good email list until probably 2015. I did have a Feedburner RSS subscribe link and their email capture form but I wasn’t doing anything else. No calls-to-action, no emailing my list to keep them engaged, nothing. I set up a Mailchimp account to manage my list. I exported Feedburner subscribers and added them to my Mailchimp account. I used different calls-to-action (popups and on-site email forms) to engage different users depending on how they are using the site. OptinMonster is a great tool for that. But when I think about years of traffic I lost, I shudder. My advice to anyone looking to start a blog would be to think about lead generation even prior to launching. Don’t miss a single visitor coming to your site! Ann Smarty is the Brand and Community manager at InternetMarketingNinjas.com as well as the founder of MyBlogU.com. She is the former Editor-in-Chief of Search Engine Journal. Follow her on Twitter as @seosmarty. 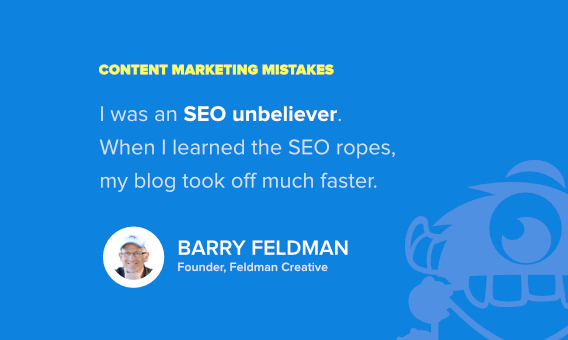 Barry Feldman: I was an SEO unbeliever. Or ignoramus. See, all bloggers struggle to build an audience in the early going, so I’m not going to go so far as to say if you learn the essentials of search it becomes a cakewalk. 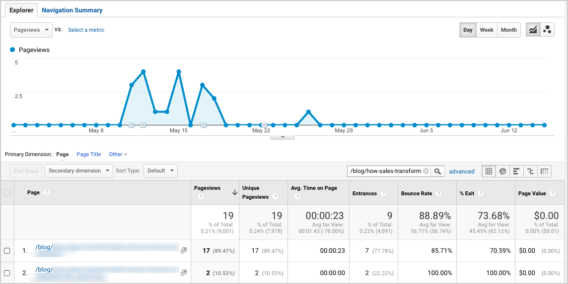 However, when I finally opened my eyes and learned the SEO ropes, my blog took off far faster. I learned so much about how to create content that ranks, I wrote a book, SEO Simplified for Short Attention Spans. I mention that not only to plug my book, but to stress that you need not become a world-class SEO nerd. You simply need to understand how to create and optimize content so it earns traffic from Google. Barry Feldman is the founder of Feldman Creative, a boutique agency that specializes in content marketing strategy and execution. He’s the co-author of new book on personal branding, The Road to Recognition. Find him on Twitter as @FeldmanCreative. Erika Heald: A former employer was trying to create a new category, and I’d drafted a plan for proprietary research to support those efforts. Our agency came back with a proposal that we couldn’t afford. I wasted a lot of time trying to convince them there had to be another way to get the research done without spending over $100k. When they weren’t able to come up with a more affordable option, I reached out to a friendly analyst firm. I was able to work with them on proprietary research and a webinar, at a third of the cost the agency had proposed. And when our contract with them was up, we replaced the agency. Erika Heald is a San Francisco-based marketing consultant and freelance writer. She focuses on helping technology and specialty food startups define their content marketing strategy to drive lead generation and customer loyalty. You can find her on her blogs erikaheald.com and erikasglutenfreekitchen.com, or hosting the weekly #ContentChat Twitter chat. 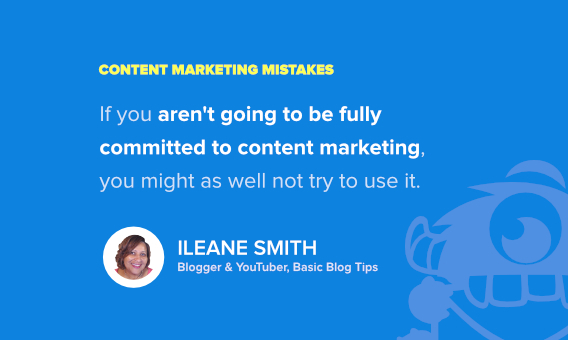 Ileane Smith My biggest content marketing mistake was thinking that the term content marketing was a myth. I think the first time I heard the term content marketing was way back in 2011, not long after I launched Basic Blog Tips in 2010. It wasn’t until I started listening to This Old Marketing, the podcast from Joe Pulizzi and Robert Rose, that I began to wrap my brain around the concept and its true meaning. Even today I continue to listen to the podcast; it’s one of my favorites! Yet the strange thing is, the more I listen, the more I understand that content marketing isn’t right for me. Before you stop reading, let me explain. If you take a look at this description found on the Content Marketing Institute website you’ll find these words: “valuable, relevant, and consistent content”. Well, over the last couple of years, I’ve only managed to fulfill two out of three on this list. Yes, my content is valuable (at least I think it is), and it’s certainly relevant, but when it comes to consistency I give myself a 6 out of 10. I know, it’s a bitter pill to swallow. But you know what they say – admitting you have a problem is the first step toward overcoming it. Joe Pulizzi will be the first one to tell you that if you aren’t going to be fully committed to content marketing, then you might as well not even try to use it. You have to be all in! What about you? Can you honestly say that you meet all three requirements? I sure hope so. But if you are still a little rough around the edges like me, follow the lead of people like Robert and Joe for guidance and when you’re ready, dive in. Here are a few more content marketers to learn from: Mark Schaefer, Jay Baer, Syed Balkhi and Wil Reynolds. Ileane Smith is a Blogger, Podcaster, YouTuber and Social Media Diva! She runs Basic Blog Tips and does weekly live streams on her YouTube channel. Find her on Twitter as @Ileane. Michael Brenner: The biggest content mistake I’ve seen other companies make is to make the content promotional. Use your content marketing to publish 100% completely customer-focused content. Then nurture those readers with offers for deeper engagement. Eventually you can send them product offers. But most brands start promoting their products too soon. Barry Feldman: The common denominator of content marketers that fail to achieve their goals is a lack of understanding of their audience. They write about their products or whatever their agenda is. Your agenda has to be educating, entertaining and inspiring your audience. You’ll only succeed by seeing things through their eyes. Debra Jason: You’re unclear on how to deliver your message. Therefore, it’s not resonating – it’s repelling your prospects. Don’t write copy that starts with the product/service. Customers don’t buy products; they buy what the products do for them (i.e., benefits, solutions). Your goal is to catch readers’ attention long enough for them to want to stop and read all of your content (or watch your video). What do you DO to make your content compelling and inviting? Begin with the concerns of your reader. Tell him/her “what’s in it for me?” (WIIFM). As a writer, create a picture in your mind of your readers – their lifestyle, their wants/needs, their pains or frustrations. Then, identify with them, put yourself in their shoes and write. #1. Focus your headline on the single strongest benefit you can offer your reader. The goal of your headline is to get them to read the next line. So, if your headline doesn’t catch attention – you lose your audience. You want people to see your value. #2. Promise something magnificent BUT do not lie. Don’t make a promise you can’t keep or you’ll lose the reader. Keep in mind that BAD news travels faster than good, so keep your readers happy. Using SHORT, SIMPLE sentences to start out with. CLARITY is extremely important. Writing TO people (not AT them). Encouraging people them to read more by making your content easy on the eyes. If your paragraphs (or your sentences) run really long, you risk losing your reader. #4. Touch on emotions. People react emotionally. So let your words touch on people’s emotions. Professional speaker and author of the award-winning book, Millionaire Marketing on a Shoestring Budget, Debra Jason has been a professional copywriter for close to 30 years. Discover more about Debra at WriteDirection.com and DebraJason.com, or follow her on Twitter: @debrajason. Barry Feldman: Far too many content marketers are one-trick ponies. They don’t allow their blogs, hubs, vlogs, podcasts — whatever their sweet spot is — to grow and cover more ground with a greater variety of media. My post, 33 Dependable Sources to Get Content Marketing Ideas, was written to teach “stuck” content creators how to better understand their audience and uncover useful topics. Ann Smarty: Unbelievably, I see more and more businesses neglect keyword research. They either lack an in-depth analysis or lack integrated approach. Keyword research should be integrated into everything you do: Video marketing, blog posts, customer support “Help” pages, “About” pages. Keywords are not just for rankings. They help you understand what your customers are searching, and hence analyze the demand and optimize the pages for better user retention. Keywords help you address customers’ needs better on your website pages and thus build audience, leads and sales. I recommend using Serpstat to analyze keywords and search engine result pages. 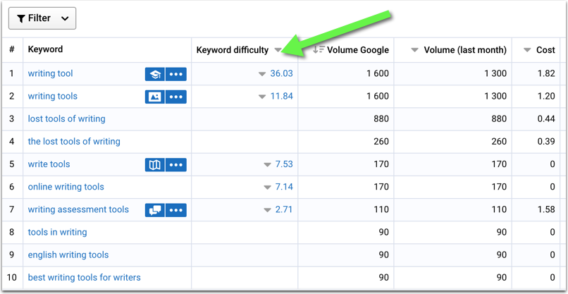 I like how they let you dig deep into keyword lists, and analyze how difficult it would be to rank for any keyword based on the competition. Here’s a quick tutorial on how to use Serpstat to discover keywords and here’s one more tutorial on organizing keywords by intent to create a solid keyword strategy. Joel Klettke: Generally, the worst and most common content marketing mistake I see is companies who don’t have any kind of plan, rhyme, research or reason behind their content. They blindly chase trends or write to a keyword set without any further thought to how pieces link together or connect to their overall funnel. Content marketing is not the process of shooting out as much “relevant” content as you can; every piece should have a purpose and a goal. There should be calls to action in your pieces, invitations to value, some greater purpose to your publishing than just publishing on its own. Avoid this problem by learning to think in funnels. WHY are you creating a piece? What’s the goal? What is the goal of the person who will read it? How can you stretch the value of that piece out by repurposing it, or connecting it to other opportunities to learn or convert? If you don’t go in with a plan, you might as well flush your cash down the toilet. 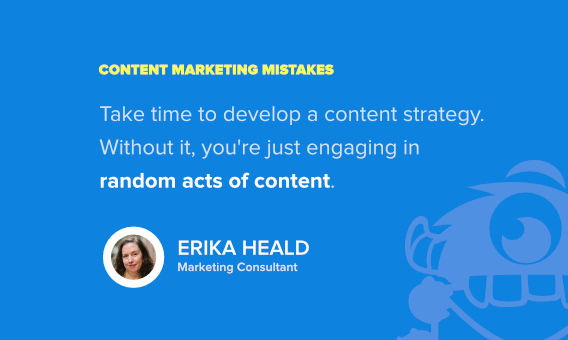 Erika Heald: The worst content marketing mistake I see marketers making is jumping in and creating content without a plan. Taking time to develop a content strategy, including robust buyer personas, gives you the foundation you need for an effective content marketing plan. Without it, you’re just engaging in random acts of content. 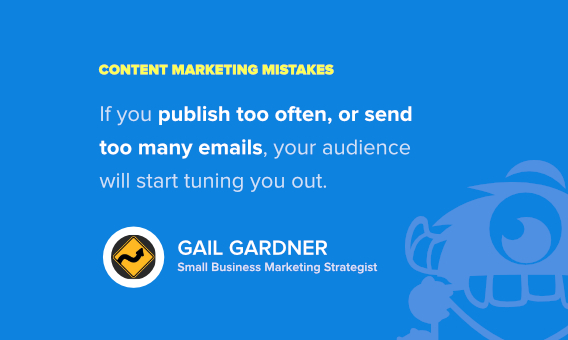 Gail Gardner: The worst content marketing mistake I see small businesses making is related to publishing frequency and content on their own blogs. They need to think about the goal of their blog and what their audience would want. Personally, even if I love them, I do not want to hear from a small business more than once a week at most. If you publish too often or send too many emails, your audience will start tuning you out. Don’t publish less than once a month or people with a typical memory may flag your email messages as spam. And finally, publish what makes sense. That might be writing about your products or making gift suggestions or sharing case studies. Figure out who your target audience is, what they want, and what you want them to do. Then publish between once a week and once a month what they would be interested in that moves them in the direction you wish. Gail Gardner is the Small Business Marketing Strategist who founded GrowMap.com. She can be found as GrowMap on all major platforms. You can find her on Twitter as @GrowMap. 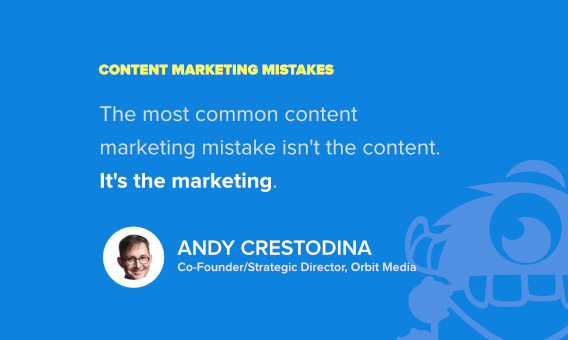 Andy Crestodina: The most common content marketing mistake isn’t the content. It’s the marketing. People write something, add an image and hit publish, then go on with their day thinking that they did a good job. The fix? Never create a piece of content without a plan to drive traffic to it. That means aligning it with a keyphrase and topic that people search for. Or collaborating with influencers who may share it. Or sending it to an engaged list of subscribers who will love that subject line. But at least as much effort into promotion as creation. “Post and pray” is all content, no marketing. And it doesn’t work. Jayson deMers: I think the worst mistake I see is marketers focusing on quantity, rather than quality content. There’s this perception that more articles in circulation are going to lead to more followers and more activity, but that’s just not the case. A few years ago, Moz and BuzzSumo ran an analysis that showed the vast majority of content never gets a single link or share, but a minority of content — the best of the best — attracts tons of links and shares. What’s especially frustrating is that producing a greater quantity of content will give you better results — but in the short-term, and with nowhere near as much potential as producing higher quality content. The fix is straightforward; spend more time on each piece you produce. Include more details, be more concise, rely on different mediums, link to higher quality sources, present fuller arguments, and write in a clearer, more audience-friendly way. It’s more difficult and more costly, but it’s definitely better to have one phenomenal article than a hundred throwaway pieces that nobody wants to read. Jayson DeMers is the founder & CEO of AudienceBloom, a Seattle-based content marketing & social media agency. You can contact him on LinkedIn or Twitter: @jaysondemers. Carolyn Frith: Many buyer personas are cobbled together based on internal thinking (a.k.a. making stuff up). In a rush to launch a content marketing program, sales and marketing teams discuss their customers, decide what they think is important to them, and base personas on their consensus. The problem? These personas end up bearing a heavy imprint from those who speak the loudest in the organization. They have zippo input from those who really know what’s going on — customers! 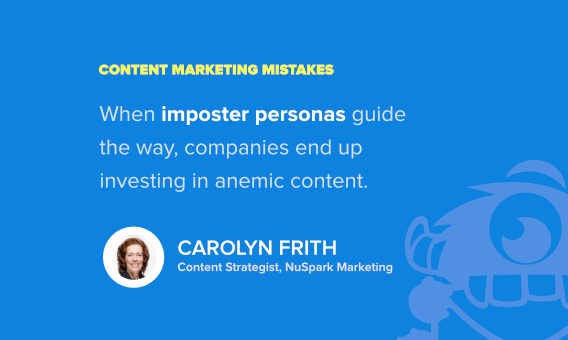 Inevitably, when imposter personas guide the way, they lead content strategies astray. Organizations end up investing in anemic content that fails either to attract buyers or to move them step-by-step through the buying journey. Unless you talk to customers, there’s no way to know where they turn for information, or what triggers them to prioritize and solve a problem. The purchase barrier your salespeople cite ad nauseam is price, but the reality is usually more complex. The bottom line is that company associates don’t know what they don’t know. And that is dangerous. Carolyn Frith, Executive Director of Content Strategy and Creation for NuSpark Marketing, aims to rid the world of snore and bore B2B copy. Get her e-book: How to Conquer 5 Common Content Marketing Problems. Find her on Twitter as @carolynfrith. 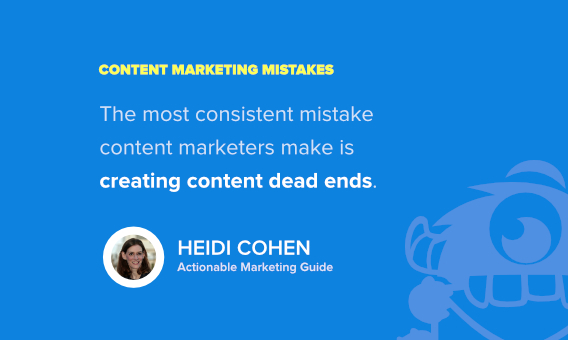 Heidi Cohen: The most consistent problem content marketers make is creating content dead ends. Specifically, marketers get visitors to a piece of content or communications and, even better, some get readers to take the next step such as signing up for emails or downloading content. BUT content marketers leave readers without offering another on-ramp to interconnected content or contact. In their minds, the marketers think that the next action is clear to the reader. Like drivers they need content GPS to find other content or action. Content dead ends are easy to fix. Look at your articles, landing pages, responder emails and welcome emails. Offer your readers content off ramps to other related content except on pages where you need to focus them on taking an action. Note: This work can be done as you create new content and update older content. Nancy Harhut: Content marketers forget about the Principle of Reciprocity. Behavioral scientists have proven that when someone does us a favor, we feel compelled to return it. Content marketers can provide that favor by serving up consistent, on point, useful information to their audience, and in return, they can enjoy resulting business. However, very often that goal of consistent, on point information is ignored in favor of getting out something – anything – to meet the deadline. Instead of regular information centered around a specific topic, they publish a hodgepodge of unrelated articles, videos, infographics, etc. with little relation to each other or an established theme. This provides little value to their target market, and no reason for that market to feel a sense of reciprocity. 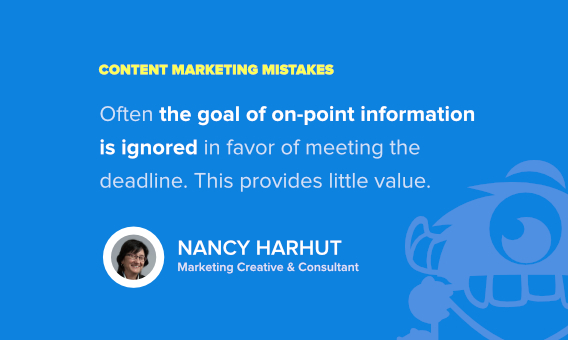 To correct this mistake, content marketers need to identify their niche or area of expertise, and then create and post a steady drumbeat of content that supports it. They need to provide topic guidelines to employees who generate content, and review any submissions against them. This approach will deliver regular value that will then trigger the Reciprocity Principle. Nancy Harhut is passionate about the impact of behavioral science on marketing. Companies seeking an added advantage tap her for consulting, creative direction and content development. Reach her at nharhut@gmail.com and follow her on Twitter: @nharhut. Jeff Bullas: One of the biggest content marketing mistakes I see people and brands making is not persisting at consistent content creation. Over time content will build search engine authority, traffic and trust. Now that you know the biggest content marketing mistakes the experts regret, you’ll be able to avoid them to create a good content marketing strategy of your own. Check out these clever content marketing examples for inspiration. Check out our email marketing guide for tips on winning customers with your content. Don’t forget to follow us on Facebook and Twitter for more in-depth guides and expert roundups. This article is incredibly helpful. I thank my colleagues for their honesty and courage for sharing their mistakes, especially Andy Crestodina. Every marketer should print this list out as a check list of what not to do. Sharon! OMG girl, this is outstanding and so truly helpful. The only problem is going to be finding the time to work through it all. I also have a couple of clients I’m going to send this to directly… Thanks so much! Thanks, Anne. So glad you liked it! 🙂 Your clients might also enjoy this article about keyword research. I hesitate to say I had stopped following one of the people in this article at one time. It was on Twitter. I had accepted the connection. Every day from that point onward, I was bombarded with “Blah Blah is now following you on Twitter!” messages. The same person every day for months. Every. Damn. Day. I stopped the madness by unfollowing. I’m happy to report that recently I reconnected, and it’s no longer an issue. But if it was a marketing ploy to build name recognition, it worked. I knew that person’s name, and not in a good way. A good list! I specially agree with point 9 and 17. Most brands do not understand that simply using superlatives no longer work in content marketing anymore. Thanks, Cyrus. 🙂 There are some more good content marketing tips in our recent article on keyword research. It was a nice juicy article, filled with useful points and tons of real world examples. Thank you so much for taking the time to put it out into the world! I’m saving it for reference! Glad you liked it, Jodi. 🙂 You might enjoy our previous roundup on writing landing page copy.